I have been having a foot problem so no hiking this Sunday. Lori and I opted do a road trip instead. We headed to the east side of the Cascades to see if we could see some Fall color in the passes and to get to some places we seldom go. We went the up to Government camp and did a little side trip down to see Still Creep Campground. We then headed on down the road to Trillion Lake to get a photo. You now have to pay $5 to stop and take a picture of it. A concessionaire was waiting at the parking pull out to take our $5. From there we headed on over to Maupin. 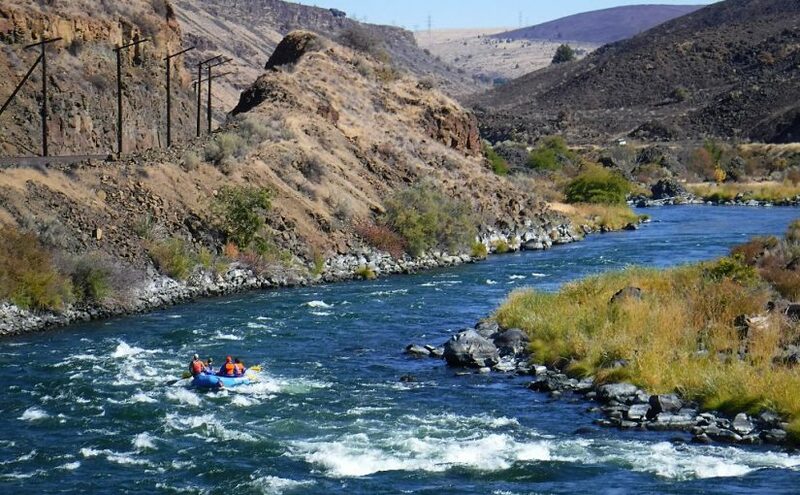 I had not been Maupin in many years and it was interesting how the place had reinvented itself to be a tourist white water rafting and fly fishing destination. After getting a late breakfast in Maupin we headed up to White River Falls State Park. We visited here two years ago but with my bad foot we could not get down to the old power house this time. From here we drove down to Sherars Bridge. We found all of the land around it was now posted as tribal land and would could pull into to a pull off and stop to take a picture without paying a $10 day use fee. So I did some photos on the fly and with no traffic just stopped in the road to photo. From here we headed back to Portland but we did do a few more stops on the way. One of our stops on the way back was at Rock Creek Reservoir. It was bone dry but the sign as we drove in to look at it said that we had to pay $5 to do that. The same concessionaire run this place as Timothy Lake. In this case no one was around so we looked for free. From here we enjoy great fall color driving up to Hwy 35. Coming back on 35 we stopped at the Pioneer Mother Grave and the “once was” campground. Our last stop was at Little ZigZag Fall. So overall it was a good road trip and we found out that public lands are not free to the public any more. Mt. Hood from Trillion Lake. The private company running Trillion Lake now charges $5 to stop and take a picture of it. Mt. Hood from Hwy 216 on the east side of the Cascades. You can tell you can tell you are on the east side it is dried out. The rain has not gotten over here yet. The place is now set up for fishing and rafting. Last building left from when Maupin was a rail road town. A raft going down the Deschutes River. Large fires swept through this area. We stopped for a late lunch at the Riverside in Maupin. Set up so a foodie person from Portland would be comfortable there. It was nice but not top draw Portland. But compared to what we use to get going to the east side it was great. The fact that they have wine shows it is not like the old east side. Use to be you had a couple of wines from boxes and Bud for beer. A warm stove for winter and out side seating for summer. They are keeping the dead animal heads on the wall tradition going. This way you know you are on the east side. Lori is heading over to get a picture of a mule deer hanging out back. Table will hold your whole rafting group. Vacation home with a river view. Looking down to the old power house. The old dam and gate house would hold water to be release as needed for power generation. Good place for a solar project. The old power house. No road down to it. So when they closed they just left everything. The keep it watered and green and to charge to visit. The area is now held captive by the Warm Spring Tribe. I got a photo from the road. The Warm Spring Tribe is suppose to manage the river here but they have let the fish ladders fall into disrepair. This will affect all runs up stream. The same private corporation is running this place as all of the Mt. Hood Campgrounds. They want Five dollars to drive in and see a dried up lake. Fish and Game stock it at tax payer expense and the Corporation charges you to enter to fish then keeps the money. Lots of parking give you an idea how much they must make when the lake is full and with fish. We stop on the way back a the grave and to see Barlow Road. Said to see just junk on the grave this time. I have been by before and have seen very meaningful items on it. Coming back we saw fabulous fall color. The Vine Maples were at the peak of color. I got these shot at decommissioned campground for free. Thank you disperse camping rules. I took Lori down to see the old tunnel under the abandon highway and almost got run over by bikes. This is way we don’t hike this trail. It has been taken over by Bombers. Short Trail up to Little ZigZag Falls. Little ZigZag Falls had lot of water flowing.